The renowned American architect Frank Lloyd Wrightonce remarked, "Tip the world over on its side and everything loose will land in Los Angeles." As the land of reinvention, Los Angeles County attracts seekers, dreamers, hustlers and wannabe actors/screenwriters/directors. Most come from somewhere else and are looking for something better. A persistent optimism and self-expressiveness permeates the air. Thanks to the movies and TV shows like Baywatch, many people think of LA as palm trees, endless beaches and bikini-clad women. But LA is far more complex. It's a mashup of the old and new, from cuisines to culture to ideas. Recently, the county has become an epicenter of contemporary art as LA philanthropists pour money into new museums and galleries. As the most populous county in the nation, with over 10 million residents, Los Angeles County comprises 88 cities with more than 100 languages spoken within its 4,752 square miles (12,308 sq km). The county is larger than the states of Rhode Island and Delaware. As the center of the entertainment industry, LA County generates $12 billion in revenue from movies. For decades the name Hollywood has been synonymous with the movie business, but today most studios have moved into neighboring suburbs such as Burbank and Culver City. Some of the better-known areas in LA County aren't even cities but rather districts or neighborhoods within Los Angeles, such as Hollywood, Silver Lake and Venice. In contrast, Beverly Hills, home to the most expensive residences in the world, and West Hollywood, a cultural mélange of gays, Russians and musicians, are cities but completely surrounded by the city of Los Angeles. Seventy miles (110 km) of beaches run along LA County's southwest border. Malibu, an exclusive beachfront community, has some of the most beautiful beaches in the area. To the north of the city of LA, hikers and mountain climbers can explore trails in the Santa Monica Mountains. To the east, the San Gabriel Mountains rise up to more than 10,000 feet above sea level. Los Angeles, the second largest city in the nation, dominates the county. Writer Dorothy Parker once quipped, "Los Angeles is 72 suburbs in search of a city." Now, well over 100 neighborhoods in LA form a rich cultural stew. Meander around downtown LA's Chinatown, Little Tokyo, the Art and Fashion Districts, the Latino enclaves around Echo Park, Hollywood's Laurel Canyon, Little Armenia, Thai Town or Melrose District where hipsters shop. When in LA, do as the celebs do and start the day in downward dog at Bryan Kest's Power Yoga studio in Santa Monica. Go shopping at Fred Segal, an LA institution known for cult beauty and makeup brands. Need an outfit for an awards show? Head over to Decades on Melrose Ave., a couture vintage store where many stylists choose red-carpet gowns for their star clients. Hungry? Eat at The Ivy, a Beverly Hills institution known for its casual chic atmosphere and the steady flow of celebrities lunching there. Or chow down on a Chili dog at Pink's in Hollywood. Watch an LA Lakers basketball game at the Staples Center and see stars on the court and in the stands. End the day sipping a cocktail at Chateau Marmont on Sunset Blvd. in West Hollywood, where celebrities meet their agents and studio execs. Conceived originally as an outdoor billboard promoting a housing development called "Hollywoodland" in 1923, the Hollywood sign sits on the south side of Mount Lee and Griffith Park—long a symbol that this is a place where dreams can come true. The first movie studio, the Nestor Motion Picture Company, opened in the fall of 1911 in Hollywood on the northwest corner of Sunset Boulevard and Gower Street. It was absorbed by the Universal Film Manufacturing Company, which later became Universal Studios. By the 1920s, 80 percent of the world's films were shot in California. Learn more about Tinsel Town's history, and experience its memorabilia at The Hollywood Museum. Or participate in the Academy of Motion Picture Arts and Sciences events and get swept up in the pre-Oscar buzz. Despite its car culture rap, LA County offers lots of outdoor activities. Rent a bike along the Santa Monica Pier and ride down the path that parallels the ocean, through Venice and onto Marina del Rey before doubling back. Pack a picnic lunch and hike Echo Mountain in Altadena or the Arroyo Seco trail system in the San Gabriel Mountains. Sign up for rock climbing instruction, or take a surfing lesson from one of the many surfing centers in Santa Monica. Or lounge around on the sand or join an impromptu beach volleyball game. Check out fossils of saber-toothed cats and mammoths that roamed the LA Basin during the Ice Age at the Page Museum at the Rancho La Brea Tar Pits. 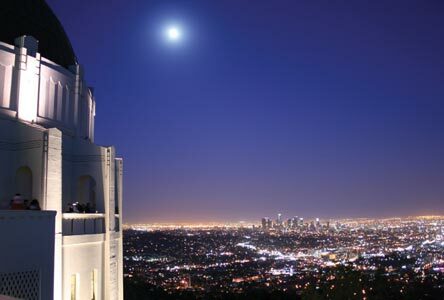 Or if the kids are tired of trying to spot stars on the ground, take them to the Griffith Observatory. Featured in many movies including Rebel Without a Cause, the observatory is set on the southern slope of Mount Hollywood in Griffith Park, with a view of the Hollywood sign and greater LA below. In addition to visiting the exhibits and events held daily at the Samuel Oschin Planetarium and Leonard Nimoy Event Horizon Theater, go enjoy the monthly, free public star parties held at the Observatory from 2:00 p.m. to 9:45 p.m. Budding astronomers and their families are encouraged to try out different telescopes and talk to amateur astronomers about the sun, moon and planets. © 2012 Globelite Travel Marketing Inc.